Our sales team are here to help and advise and we will find a solution to suit your home. The photo and video tours of our showroom show a selection of products available. 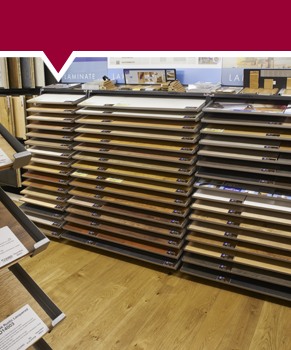 We have a huge range of hardwood and laminate flooring in our Oxford Showroom. Laminate flooring is an extremely hardwearing floor covering, which is made up of a number of layers. The board starts with a HDF core, which then has a decorative resin finish applied to it. This is followed by a resistant overlay film, which is fused onto the top surface. Designs have vastly improved over recent years and it is now virtually impossible to tell a good quality laminate from a real wood floor once it is laid. With new finishes such as registered embossing, beveled edges and extremely realistic textures, laminates now look as good as the real thing. We have a brilliant range of laminate flooring styles and brands at even better prices. You'll be spoilt for choice.